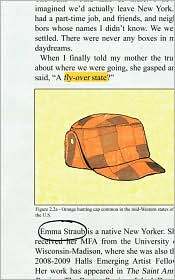 When Michael Schaub and the Largehearted Boy started raving about Emma Schaub’s Fly-over State on Twitter, it took me roughly 48 seconds to order up the book. That kind of hype cannot be withstood. Besides, nobody has influenced my reading over the past few years more than they have. It was high hopes and an open heart that I dove into this odd little book by Emma Straub. That’s not meant to be dismissive. It is an odd little book. It’s only 77 pages and contains two short stories. The, for lack of a better term, supersized short story “Fly-over State” (it’s too short to be a novella, probably too long to be considered a traditional short story, but then I have no idea what the rules are on these kinds of things) and a regular-sized short story “Hot Springs Eternal.” The format is unique and I hope to see more odd little books like it. Plus, for only $8, you can’t go wrong. Like I said, I jumped head first into this the story “Fly-over State” and waited for magic. I liked Sophie, a New York writer who is plopped into the Midwest after her husband starts teaching at a school in Wisconsin. Sophie’s alienated, obviously, and out of her element. Her observations, which are rarely snarky, about life in the Midwest seem more like critiques of suburbia in general and the not fly-over states specifically. But still it mostly comes off as “this is weird to me” which is understandable. Eventually Sophie makes a friend in the neighbor’s twenty-something son, Mud. As Sophie and Mud’s friendship grows so did my unease. Not because of Straub’s writing, it’s good, but because her story reminded me too much of Stacey Richter’s “Christ Their Lord.” The stories are eerily similar — disaffected women in strange places; partners who are pre-occupied with their jobs; creepy, pot-smoking boys next door who are really too old to be living with their parents. While Richter’s story tends toward the fantastic and absurd, Straub’s veers toward melancholy. But once my brain latched on to the Richter comparison it wouldn’t let go and it overshadowed the entire story. Thankfully, nothing overshadowed “Hot Springs Eternal” the other short story included in this book. Here we find Richard, a snobby professor, road-tripping out west with his younger boyfriend Teddy. Richard’s pretty sure their relationship of five-years is nearly over, but agrees to go on the trip anyway. As you might imagine, things don’t go so well for the couple. What Straub does so well in this story is create a pretty unlikeable narrator (Richard’s snooty, judgmental, and kind of a crab) who the reader still cares about. In fact, despite his annoying traits (one of which is listing Teddy’s annoying traits) the reader will be delighted by Richard and the action he takes.